Vitiligo is a condition where patches of unpigmented skin appear on parts of your body. It occurs because the cells that make up the color in your skin (melanocytes or pigment) break down. The cause of vitiligo isn’t fully known. Some experts say it could be an autoimmune disease, which is when your immune system mistakenly attacks a seemingly healthy part of your own body. In this case, the immune system mistakenly attacks your melanocytes. It could be that vitiligo is hereditary, but no one knows for sure. Regardless of race or gender, anyone can develop vitiligo. It’s a life-long condition but there are ways to minimize or balance out the appearance of the discoloration. Mind your shadow – when your shadow is shorter than you are, that’s when the sun’s rays are especially damaging. Be sure to seek shade during peak sun times. Vitiligo appears as patches of unpigmented skin and can affect the skin on any part of your body. These patches are more commonly found in the areas where your skin is exposed to the sun, but can appear on places like your hair or inside your mouth. Localized vitiligo affects specific areas, such as your hands, arms, face, feet, etc. Localized vitiligo can be segmental (located on one segment of the body) or non-segmental (located on various parts of your body). For example, it’s possible to have vitiligo on your hands and knees. Treatment of vitiligo is intended to make the skin look “even.” For localized vitiligo, you can use a product like Chromelin Complexion Blender, a skin dye designed to help match the patches of vitiligo with your natural skin tone. Generalized vitiligo is the most common kind, appearing as scattered patches of pigment loss in the skin, on multiple parts of the body. In addition to skin dyes, people affected with vitiligo should wear sunscreen. The sun’s harsh rays can speed up the progression of vitiligo. Universal vitiligo appears as pigment loss over the majority of your body. It’s a more rare form of vitiligo, but can affect up to more than 80% of your skin. In addition to using dyes and cover-ups, those affected with universal vitiligo should protect their skin to slow down the progression of the vitiligo. Coupled with sunscreen, make sure that your clothing options protect your skin from the sun. The most common symptom of vitiligo is discoloration on the skin – appearing as light or white blotches on the surface. Segmental vitiligo refers to the condition affecting one segment or side of your body (e.g. hand, leg, face, etc.) and/or your hair. These symptoms tend to appear at an earlier age and only progress for a few years. Non-segmental vitiligo refers to the more common type of vitilgo that affects both sides of the body. It often starts in a short timeframe as discoloration in the hands, feet, or face. Throughout the person’s life, the affected areas may expand. According to the Mayo Clinic, no drug can stop the process of vitiligo, but some products, like Chromelin, can help improve your skin’s appearance. Improving your skin’s appearance as well as accepting it is how to treat vitiligo. 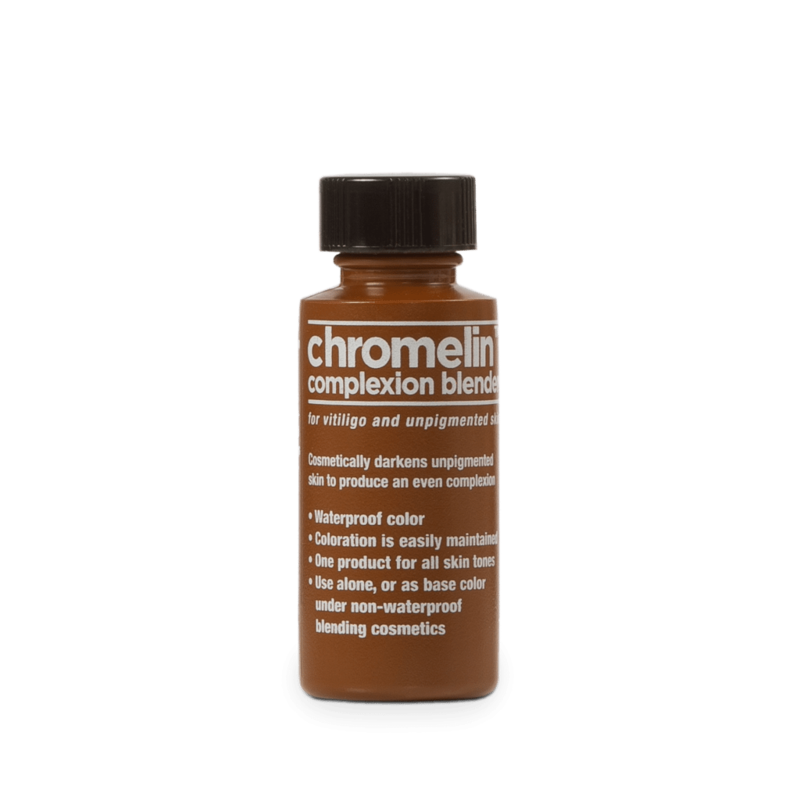 Chromelin® Complexion Blender is a waterproof skin dye used to darken unpigmented or light areas of the skin affected by vitiligo, scars, or other causes. Chromelin Complexion Blender is an effective solution for those with skin discoloration. Protect your skin from the sun. Use sunscreen every day and reapply every two hours when outdoors. The sun’s harsh rays can exacerbate your vitiligo. Make sure you wear clothing that protects your skin. Stress contributes to the spread of vitiligo. Make time to relax and take care of yourself. According to Vitiligo Support International, Inc., studies have shown that people with vitiligo are often deficient in certain vitamins, like folic acid, B12, copper and zinc.